heat and set aside for 10 minutes. a balloon whisk until combined. Stir in the cream mixture and Baileys and pour into 6 small ramekins. 3	Put the ramekins in a roasting tin and add enough cold water to the tin to come two thirds of the way up the sides of the ramekins. Carefully put the roasting tin in the oven and cook for 30–40 minutes, or until just set. Remove from the tin and leave to cool, then chill for 2 hours. 4	Preheat the grill to hot. 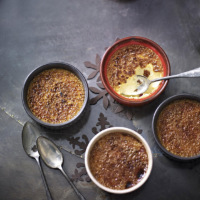 Sprinkle the demerara sugar in an even layer over the brûlées and grill until the sugar has melted, about 2 minutes. Leave to cool until the sugar has set, then serve straight away. If you have a cook’s blowtorch, use it instead of the grill to melt the sugar on top of the brûlées as it’s much easier to control the heat.